Our decent work movement is going strong as the Government Committee on Finance and Economic Affairs began a review of Bill 148: the Fair Workplaces, Better Jobs Act today. Just yesterday, we read the Toronto Star’s editorial in support of a $15 minimum wage, which reflects the growing support for our demands to make workplaces decent. We also saw this during July’s 10 days of public hearings across Ontario, where the $15 & Fairness Campaign had a strong showing every step of the way. Many workers, community groups, university and college teachers, unions, doctors and small business owners deputed and spoke up in favor of the proposed legislation. Hundreds more sent in letters calling on the government to make Bill 148 stronger. We hope all of this support will make sure the Standing Committee members do not weaken the bill as they review amendments this week. Our communities expect all our elected officials to be decent work champions and deliver the strongest possible labour law reform before the end of 2017. While Bill 148 is about labour laws, we know its impact extends far beyond workers and employers. Labour law reform is about making life more livable for everyone in our communities. When we take a look at who our allies are in the campaign for $15 and Fairness, we see just how cross-cutting the issue of work really is. A diverse group of over 200 faith leaders are increasingly speaking up because they witness in their own communities the daily struggles of low wage workers and their families facing poverty. In a public statement, they say, “We know that decent working conditions are essential to strong and prosperous communities, and are distressed that Ontario’s current labour laws do not protect workers from poverty.” In the coming weeks, faith leaders will be delivering sermons on the issue of $15 minimum wage, collecting petitions at their places of worship and joining with other campaign supporters to do outreach at high holidays such as Eid Al Adha & Bandi Chhor. Are you a faith leader interested in participating? Please email info@15andfairness.org to learn more, including information about upcoming multi-faith organizing meetings. We need to keep mobilizing more than ever as there is a long parliamentary process ahead of us before the bill is passed. After the Ontario legislature reconvenes on September 11, Bill 148 will be sent to Second Reading. Then after Second Reading, Bill 148 will be sent back to the government committee for more amendments. We are hoping this will be short and swift as the bill will then need to go through Third Reading and Royal Assent. Since the government just completed a two-year review of Ontario’s labour laws, we see no real reason to drag out this process, and delay the necessary protections and wage increases workers across the province urgently need. This is why we must speak out, and keep on calling for $15 & Fairness now. With a provincial election set for June 2018, it is vital that we get this legislation adopted before the end of this calendar year. You have most likely seen the corporate attack on Bill 148 that is making headlines. This pushback could have the effect of slowing the process down or weakening the bill. We can’t allow that to happen. Even though the big business lobby keeps repeating myths on the minimum wage and using scare tactics, we are seeing more workers (and small businesses) speaking up in favor of a $15 minimum wage than ever before. We must all raise our voices right now, and instill confidence in our communities to contact their Members of Provincial Parliament to say how vital Bill 148 is to them and to the future of Ontario. To learn more about what is in Bill 148, check out this short video. 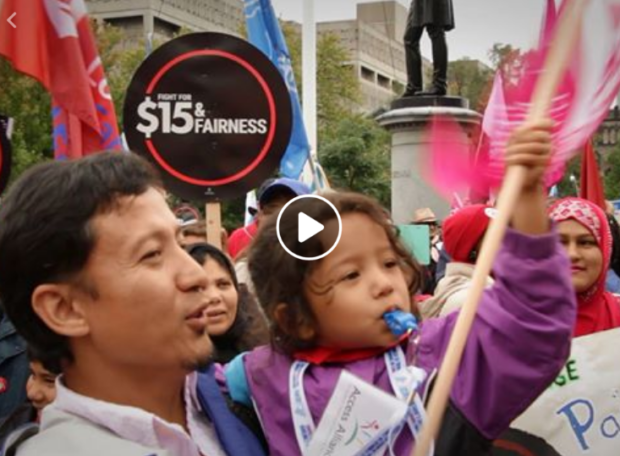 Then help us spread the word by sharing this video with your friends and co-workers, and sending a letter to your local newspaper in favor of $15 & Fairness.